The glorious angels sang on Wednesday, January 16, 2019, as Howard Kenneth Stokes was called Home to the arms of our amazing Lord. Howard was 87 years old and lived in Jasper for the past 63 years. He was of the Methodist faith and was a member of Pleasant Grove United Methodist Church in Jasper. Howard was a well-known citizen from Marion County and everyone that knew him loved him from his first “hello” to his last “goodbye”. He loved fishing, hunting, gardening, reading, playing Sudoku and most of all his Marion County Warriors. Howard also loved showing off his “prized crappie” as his friends and family will share with you. 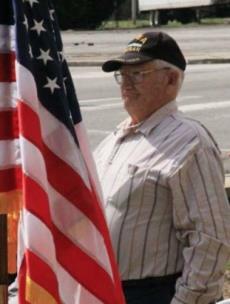 Howard was a sergeant in the United States Army and veteran of the Korean War. He then began his 42-year career at Mueller Company as a machinist until his retirement. He was preceded in death by his parents, Walter and Viola Stokes; sister, Louise Coffman; daughter-in-law, Teresa Kay Stokes; and grandson, Christopher Lee Stokes. Those left to continue Howard’s memories are his beloved wife of 68 years, Mary “Nancy” Stokes; son, Robert (Rhonda) Stokes; daughters, Ann (Dooner) Walden and Martha (Steve) LeRoy; brother, William “Bill” (Nancy) Stokes; grandchildren; Keith (Kristy) Walden; Jonathan (Charlie) Walden, Melissa (Joseph) McGuire; Tanner (Brook) Roberts; great-children, Victoria Walden, Trey McGuire and Rilee Robertson along with several nieces and nephews. The family will have visitations at Tate Funeral Home on Saturday, Jan. 19, from 6-8 p.m. CST and on Sunday, Jan. 20, from 11 a.m. to 2 p.m. CST. Funeral services will be officiated by Pastor Cecil Baxter and begin at 2 p.m. CST in the chapel of Tate Funeral Home. Military honors will be presented by Sequatchie Valley Honor Guard. Howard will be laid to rest after the service at Sequatchie Valley Memorial Gardens. Contributions may be made to Pleasant Grove United Methodist Church in honor of Mr. Stokes. Funeral arrangements have been entrusted to Tate Funeral Home, 950 Mel Dixon Lane, Jasper, Tn. 37347.